While looking through boxes in the attic last weekend, I found a few of my school notebooks. I had fun reading some of my English essays and reminiscing about the teachers who taught me to be a better writer. As parents, we can teach our kids to write, too. Here's my list of 10 ways we can encourage our kids to write and be silly scribes. My girls love to make up stories, which means they can write a play. While creating the story, imagining the setting, and developing the characters, they have fun and end up with a fun play to act out on our next family game night. Nurture your child's inner reporter when you set up an interview with a resident at a local senior center, a relative, or a community leader. After the interview, your kids can write a story about the person they talked with. Not only will your kids get practice talking to people and writing about it, but they'll also build relationships. During one of our recent hikes, my girls started making up silly rhymes about things they saw in nature. It was so funny that I asked them to write down their poems. Your kids can turn nature adventures into writing opportunities, too, as they observe and record what they see, hear, do, and experience in the great outdoors. Thanks to the internet, we can easily connect with people from around the world. I signed my girls up to be pen pals with the daughters of one of my college roommates, and they enjoy sending snail mail and email messages to their friends. Your kids can also become a pen pal with a relative, friend, or neighbor as they practice their writing skills. If you've never participated in a chain story, start one with your kids! Each person writes a sentence before passing the story on to the next person. Another version is to write only two words as you pass the story around. Let the story go on for a week or so, and after you're finished writing, read the story out loud. It's hilarious! Get ready to laugh and teach your kids the parts of speech when you write Mad Libs. I found an online version my kids like, or your kids can write their own. It's a hilarious and educational activity for the whole family! If your kids laugh at comics like my girls do, challenge them to write their own. They can start with an original drawing or the caption as they create an entertaining comic strip. When my girls were little, I took time each day to jot down the milestones they reached, their funny sayings, and a sentence or two about what we did that day. It's fun to read now, and that's why I encourage them to keep a journal. 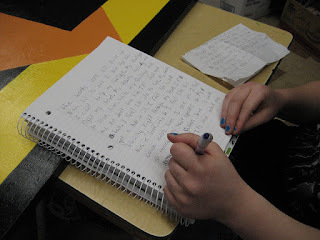 They can use it to record the details of their day, or they can select a writing prompt as they have fun journaling. To keep in touch with family members in other states, one of my friends started a family newsletter. Her kids write articles about their activities, share a favorite family recipe, and draw pictures. It's a fun way to stay connected, and it gives your kids writing practice! Challenge your kids to use their creativity to answer "what if" questions. What if the sky were green? How would life be different if I lived in Australia? This writing game encourages kids to think outside the box and is a fun way to get to know your kids better. Do you want your kids to become silly scribes? Try these 10 playful tips that encourage kids to write. What other tips would you add to the list?